Buying or refinancing a home with a FHA 203k mortgage offers a few advantages if your property is not already perfect. That is because you can add renovation costs into your purchase loan or your refinance loan. Here is a guide to FHA 203k construction and remodeling your mortgage. 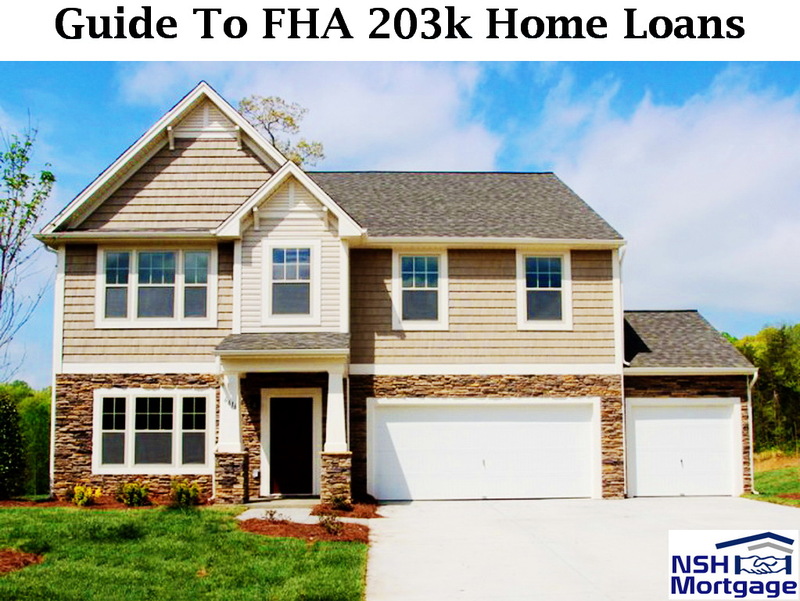 NSH Mortgage has the knowledge and tools to help you understand how to finance a FHA 203k home loan. So you should choose the FHA 203k mortgage for larger projects, like for buying a fixer upper or refinancing your home while also funding major renovations. Another option is the FHA’s Title One loan, which allows you to finance your smaller projects. Plus it is not tied to a refinance or home purchase loan. But for either of these loans, you will need to work with a FHA approved mortgage lender. Financing home improvements with FHA can be better than getting a home equity loan for your improvements. That is because home equity loans require home equity and this product does not. It allows you to add the construction costs to your loan and uses the improved value of the property to calculate your loan to value ratio. You can use the 203k mortgage to finance your home purchase and add improvements at the same time. Or you can get a 203k refinance and include your improvements in that loan. The improvement refinance, is somewhat like a cash-out refinance, but you do not need equity and you do not incur the risk based on surcharges that you pay with cash-out refinancing. You can also choose the standard 203k, which works for renovations which are costing more than $35,000, or the Limited program for smaller projects. This standard program requires that you work with an approved 203k consultant to work out the costs of the upgrades. FHA eligibility is not as rigorous as you might think. Even if you are eligible you will still need to meet the FHA’s underwriting standards to get loan approved. Finance a house that is at least one year old. Borrow a total amount that is less than the FHA’s maximum loan amount for your area. Have at least $5,000 for rehabilitation or renovation costs. Household structural changes or rebuilding. Eliminating health and safety hazards. Improving or updating your home’s appearance. Reconditioning or replacing the plumbing systems. Installing a well or septic system for sanitary purposes. Adding or replacing your houses roofing, downspouts, or gutters. Adding or replacing interior or exterior flooring. Making site improvements or adding more landscaping. Making the home accessible for handicapped individuals. Green renovation or energy conservation projects. These projects are especially useful for bringing an old home up to code. Here are a few steps you will have to complete when buying a fixer upper with a FHA 203k loan. This is a little bit different from a regular loan, because you will be submitting your list of improvements. And this loan does not completely fund these improvements until they are all completed. So you should find a lender who is approved to do 203k loans. Then get several mortgage quotes so you can be confident that you are getting a good deal. Secondly you should apply for your home loan and get a pre-approval letter. Next you will want to find a property. So make sure that your offer contains language showing that you need a 203k loan to complete the purchase. Please note that your maximum loan amount calculations are different for purchases. Check out HUD’s Maximum Mortgage Worksheet for more information. Afterwards you will need to find a FHA 203k consultant, if your improvement costs will exceed $35,000. These consultants will arrange for a detailed proposal from licensed contractors. It will contain the scope of the work that is to be done and gives a detailed cost estimate. Then you will need a contractor to write an estimate of work needed and materials required. You are not allowed to do the work yourself unless you are a professional builder. Finally the lender, after giving you the okay, will get your home appraised with and without the improvements. When the loan closes and funds, the seller gets paid. The rest of the money from your lender goes into your escrow account. The lender or his agents, releases escrowed funds to the contractor as work is completed. Once your contractor completes the work, you now own a renovated house that may already be worth more than you paid for it. That is a sound investment as well as a home customized to your specific needs. How Much Can You Refinance? Firstly, you will need to get the values for your current mortgage on the property, plus the rehabilitation values, and the certain closing costs. Secondly, you will want to calculate the current property value plus its rehabilitation costs. Finally, you will need to find 110 percent of the improved value multiplied by FHA’s 97.75 percent maximum loan to value ratio. This will come out as 96.5 percent for purchases. So if you have owned the property for less than one year, the lender must use acquisition cost plus the documented rehabilitation costs for your maximum loan amount. $300,000 + $50,000 + $5,000 = $355,000. $305,000 + $50,000 = $355,000. $350,000 x 1.10 x 0.9775 = $3716,338. So here, your maximum loan amount is $355,000. Your FHA mortgage will pay off your old loan and include extra to cover your closing costs and $50,000 in renovations. FHA’s Limited 203k program lets you wrap up to $35,000 in renovation expenses into your mortgage to repair, improve, or upgrade your house. You do not have to work with a consultant. But you will have to work with your contractor to file a work plan with your application. If you like your current mortgage, since your current loan has no mortgage insurance. Or you have got an untouchable low rate. And if you do not need a huge loan for your home improvement, a FHA Title One loan may be your best choice. Low closing costs, because your loan amount is much lower. And it has easy processing. If your loan is lower than $7,500, all you will need is a signature but it must have no lien recorded against your home. You can do the work yourself if you are qualified. Manufactured homes are eligible for Title One loans with a max of $17,500 for 15 years. Keep in mind that FHA 203k loans are funded by lenders, not by the HUD. Private lenders set interest rates and loan fees. So, compare quotes from several competing mortgage lenders to find the best mortgage rates, just as you would for any other home loan. Guide To FHA Home Loans And How Much Income Do You Need To Qualify?